Moist and supple texture with a light, citrus flavour. Netherton Farm is part of the Duchy of Cornwall Estate and has been home to Mike and Margaret Horrell since the 1960s. The farm has always been principally a dairy farm and twenty years ago it was suggested by the Duchy Estate that the Horrells should consider adding value to their milk by making cheese. Mike and Margaret were introduced to two Welsh cheese-makers, Alan and Jenny Gray. The intention was to make a cheese with a Cornish character and Alan and Jenny set to work on a thirteenth century cheese recipe. A cheese somewhere between a cheddar and a Caerphilly was the result but with a distinctive nettle-leaf coating. A Cornish-sounding name was given to the cheese - 'Yarg'. This is in fact the makers' name 'Gray' spelt backwards but it possessed the Cornish feel that was needed. The Duchy of Cornwall Estate is a very professional body and believes in being innovative and investing in ambitious projects. Three years were spent installing expensive new cheese-making facilities. The Grays had brought along their own old cheese-vat but it became redundant before any cheese was ever made. This was not going to be a small farm venture battling with meagre funding but a larger commercial operation. Over the next few years the herd grew to over 500 animals and so successful was the marketing of this distinctive Cornish cheese that production increased from three to five days a week. At this point the Grays moved on and the Horrells continued with the help of a staff of twelve. Recently a visitors' centre was opened at the farm and it has become a popular tourist attraction. All of the milk from the farm is pasteurised. This is a necessity when taking milk from such a large herd since contact with the animals cannot be as closely monitored as with a small herd and the risk of undetected problems is increased. Pasteurising also makes the final cheese more predictable and reliable and although, perhaps not as exciting as matured unpasteurised cheese this process is essential when contact time with each cheese is limited. 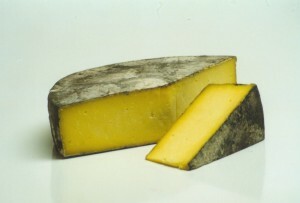 Cornish Yarg is a moist cheese which tastes fresh and creamy with a gentle tang. The cheeses are matured for a minimum of three weeks but maturation can take up to two months. During this time the crumbly paste becomes softer at the edges and this texture then advances towards the centre. The flavour becomes less tangy and more musty with age. The nettles are edible but most people tend to discard them. They are picked locally and are frozen until needed. This is not only convenient but essential since the freezing takes away the sting and causes the leaves to become limp and easier to apply. The leaves are dipped into a sterilizing solution and are then applied using a brush. It is believed that nettle leaves were used originally because they prevented the cheese from drying out too quickly and protected it from flies. Nettles also grew in abundance and cost nothing. Each cheese is approximately 25cm in diameter, 7cm thick, weighs 3kg and has a fat content of 45%. Smaller 1kg cheeses are also made but only the larger cutting Cornish Yarg is stocked at the Teddington Cheese.